Dounreay Tri Ltd has closed a EUR 45.0 million Sr Sec bond issued in the Nordic bond market. The bonds have a tenor of 3 years and a fixed coupon of 10.0%. Use of proceeds is to partially fund construction costs of the company’s planned 10MW floating offshore wind installation. The bond issue follows final project approval from the Scottish government, which was obtained on 17th March. Dounreay Tri will now commence construction of the floating platform at the NIGG Shipyard in Scotland while the columns for the turbines will be manufactured by the Keppel Shipyard in Singapore. Nigg will also complete the final assembly and the unit is scheduled to be in operation in July 2018. The bond raising marks an important milestone for Dounreay Tri, for the Scottish wind industry, and for the floating offshore wind industry globally. For further information contact: Simon James (07984 493071). An impression of the Dounreay Trì facility is attached to this press release. 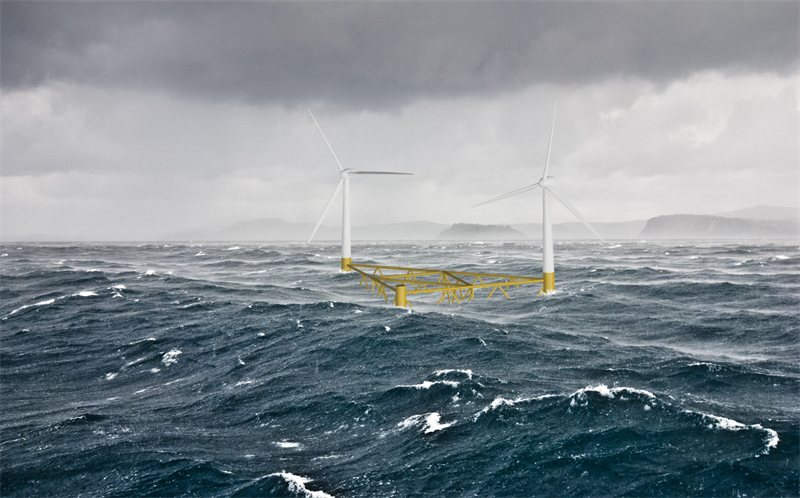 The wind farm will be deployed in Scottish Territorial Waters approximately 9km off Dounreay, Caithness in the summer of 2018. In order to proceed the application to Marine Scotland and Scottish Ministers must be processed by 31 March as the Renewable Obligation Certificate level required is only available to projects approved by that date.  A substation or switchgear to transfer power to the grid, at, or near, the existing Dounreay Substation. Hexicon’s flytande plattformar möjliggör storskalig och konkurrenskraftig energiproduktion till havs, på områden som normalt inte kan utnyttjas på grund av stora djup eller svåra bottenförhållanden. Konceptet med en vridbar plattform är utvecklat av innovatörer från den marina industrin och vindkraftindustrin. Hexicon AB grundades 2009 och är ett design och utvecklingsföretag som levererar kunskap, lösningar och IP rättigheter.